The Aflac Cancer and Blood Disorders Center of Children's Healthcare of Atlanta (Children's) is recognized as one of the largest and most respected pediatric hematology/oncology programs in the United States. Staffed by Winship Cancer Institute-affiliated pediatric oncologists and researchers, the Aflac Cancer Center cares for more than 450 newly diagnosed cancer patients each year. It is also a national leader in enrolling children in innovative therapeutic clinical trials. The relationship between Children's and Aflac began more than 20 years ago when Kathelen and Dan Amos initiated the Aflac Foundation's groundbreaking charitable contribution. In 1995, Aflac announced that it was dedicated to treating and curing childhood cancer and pledged $3 million to establish the Aflac Cancer Center. Since then, Aflac has contributed more than $116 million to the Aflac Cancer and Blood Disorders Center. 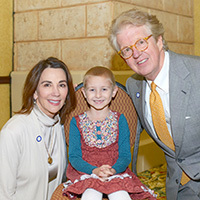 Douglas Graham, MD, PhD, director of the Aflac Cancer and Blood Disorders Center, Daniel P. Amos Chair, and Winship Executive Committee member, says "The generosity of the Amos family and the Aflac Foundation has allowed the Aflac Cancer Center to make great strides in research that will hopefully lead to a cure for pediatric cancer. We believe that every child deserves a lifetime, and we strive to make that a reality through our basic and translational research efforts. The Amos family and Aflac have been wonderful partners over the years, and we look forward to continuing our partnership." 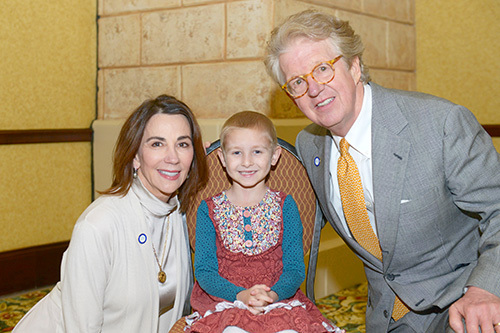 Kathelen and Dan Amos pose with Aflac patient, Brylie Lundy.